An authoritarian surveillance state is being built in the US, while a massive land grab for power, by billionaires via our data, subverting British democracy, is well under way. 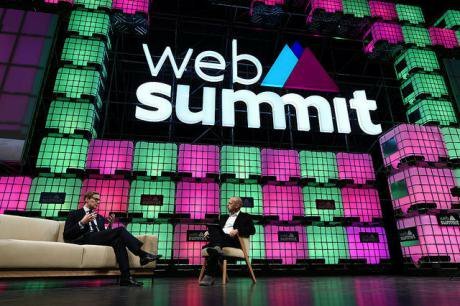 Alexander Nix, left, CEO, Cambridge Analytica, and Matthew Freud, Founder & Chairman, Freuds, on Centre Stage during day three of Web Summit 2017 at Altice Arena in Lisbon. Flickr/Sam Barnes/Web Summit. Some rights reserved.The scandal deepens. What were the roles of Cambridge Analytica, the abuse of Facebook data, the permissiveness of Mark Zuckerberg’s company, shady funders and Russian bots in Trump’s election, Brexit and other dark abuses of democracy? One part of the story is the extraordinary passivity of the corporate media in face of glaring evidence. Another, the courageous role of reporters and ‘mavericks’ such as the Observer’s Carole Cadwalladr and the UK’s ByLine (with whom openDemocracy partners). Cadwalladr’s riveting interview with Christopher Wylie being just the latest example. Their persistence helped to break the complicity and have now brought in bigger news organisations like the New York Times and Channel 4. The British are catching up with an American awareness of the intertwined political influence of the secretive super-rich, social media, and the Kremlin. In America, illicit support for Trump has been investigated by intelligence agencies, Justice Department officials, and major media organizations. Uncovering election interference in Brexit-Britain has been a more freelance business. About a year ago, Carole Cadwalladr, a regular contributor to The Observer newspaper, started researching the “right-wing fake news ecosystem” and its capture of web searches through Google especially. This line of inquiry has also been followed by ByLine, a crowdfunded investigative journalism initiative, which hosts a regular column by J.J. Patrick, who has been mapping the scale and penetration of Russian trolls and bots sowing hatred and division via social media. Cadwalladr’s reporting led her to uncover the part played by Cambridge Analytica in the Brexit referendum. This company, London-based but US-owned (principally by the hedge-fund billionaire Robert Mercer, who was one of Donald Trump’s biggest donors), generated the “220 million” data sets of US voters’ details that underpinned Trump’s Facebook campaign. This employed so-called black ads only seen by targeted voters, a process that bypasses and undermines the shared political community essential for democracy. Cadwalladr found that the firm had also acted on behalf of the Vote Leave campaign in Britain – though Cambridge Analytica denied elements of her reporting. In a follow-up article, she described how “a website called CNSnews.com… dominated Google’s search algorithm,” flooding it with reports that established media outlets are “fake” and “dead”; this site was backed, too, by Mercer’s foundation. Cadwalladr also met with Andy Wigmore, who had been the director of communications for Nigel Farage, the former head of the UK Independence Party (UKIP) and leading Leave campaigner who has subsequently emerged as a Trump acolyte. Cadwalladr learned that Farage was friends with Mercer and, as Wigmore told her, that Mercer had directed Cambridge Analytica to help the Brexit campaign. According to the UK’s election law, all gifts in kind must be declared for their monetary worth and none can come from overseas donors. The UK’s Electoral Commission is now investigating this apparent double breach; Cambridge Analytica, meanwhile, is pursuing legal action against The Observer. As Cadwalladr was developing her thesis about this new machinery of political subversion, the UK editor of openDemocracy, Adam Ramsay, made a discovery of his own (I was the first editor of openDemocracy but was not involved with this story). With Peter Geoghegan, Ramsay showed how large sums of money were sent to the Vote Leave campaign during the EU referendum via a small, hard-line Loyalist party in Northern Ireland, the Democratic Unionist Party (DUP). (By curious serendipity, Prime Minister Theresa May was forced to form a coalition government with the DUP after her Conservative Party lost its parliamentary majority in the general election of June 2017.) The loophole-ridden regulations governing British elections permit Northern Irish parties the unique privilege of not having to declare the source of their donations. A policy once justified by security concerns during the Troubles was abused by as-yet unidentified Brexit supporters to channel a secret, roughly half-million-dollar donation through the DUP to be spent mostly in mainland Britain. Screen shot: Sun, June 13, 2016. As Cadwalladr continues to report on the effects of Vote Leave’s “dark campaign” and its funding, she acknowledges others’ arguments that Brexit was also caused by, for example, “rising inequality, frustration with elites, economic uncertainty.” I would add to those factors the resurgence of a particular English nationalism based on the dream of a resurgent “Great Britain,” which was seduced by the pro-Brexit campaign slogan “Take back control.” Nationalist sentiment of this sort will not be undermined by any revelations about Russian trouble-making or covert support from American billionaires – any more than Trump’s base seems likely to abandon the president over what the investigation of Special Counsel Robert Mueller may discover. In both the US and the UK, investigations into the deployment of these shadowy forces are still in progress. In close contests, every influence counts. There is, therefore, an understandable temptation to emphasize that without secretive billionaires, or the Russians, or Facebook, the outcomes of the Brexit referendum and the US presidential election would have been different. And as elections are likely to carry on being close-run, it is important to track down and expose systemic manipulation. But it does not follow that slush funds, algorithms, and alleged conspiracies were primary causes of the electoral shocks of 2016. Nearly 63 million Americans voted for Trump, although Hillary Clinton outspent him by half a billion dollars. In the UK, 52 percent of voters backed Brexit. A widespread revolt against elite entitlement and genuine resentment against a rigged system are the most important explanations in both cases. Trump, at least, can be voted out of office in three years’ time. Britain’s referendum decision to quit the European Union will not be so easily reversed. Should the UK leave the EU on schedule at the end of March 2019, impoverishment and humiliation are likely; even a successful Brexit, if such is possible, will pitch the UK into permanent competition with the Continent. Either outcome is repugnant for large majorities of voters in London, Scotland, and Northern Ireland. With the stakes so high, anything that undermines the legitimacy of Brexit fills its Remain-voting opponents with hopes of a reprieve. This could be a dangerous delusion. The emerging picture of efforts to manipulate the outcomes of the US election and the Brexit referendum leads to an awkward paradox. For the first time in a long time, voters who recognized the rigged nature of the system voted in large enough numbers to overthrow “the swamp” of “politics as usual”; at the same time, the system itself was perhaps more rigged than ever, thanks to the new-fangled methods. While it is vital to expose how these worked, it is even more important also to develop a politics that validates voters’ legitimate repudiation of a corrupt establishment, rather than dismisses them as ignorant and gullible. The risk of exaggerating the effect of novel methods of subversion is that it will only reinforce cynicism about politics and government in general—and that would be a win for billionaires like Robert Mercer, and their friends and helpers like Nigel Farage, and all they stand for. Voters who recognized the rigged nature of the system voted in large enough numbers to overthrow “the swamp” of “politics as usual”; at the same time, the system itself was perhaps more rigged than ever, thanks to the new-fangled methods. This is the trap from which democracy in Britain and America must now extricate itself. There will have to be a credible alternative and not a return to the status quo that led to the revolts of 2016. In Britain, the advocates of Brexit captured a wish for self-government with their slogan “take back control”—a desire for democratic accountability that must be freed from the grasp of demagogy, not derided. As for the US, Trump pledged in Pennsylvania that he would speak for “the millions of our workers with nothing but poverty and heartache.” By all means, mock his hypocrisy, but the only way to combat his influence effectively will be by a politics that does speak for millions of workers. It is possible to spring the trap. Behind both Brexit and Trump was a widespread repudiation of entitlement. Part of its energy in Britain has now gathered around a resurgent Labour Party, which made unexpected gains in June’s general election despite vicious attacks from the right-wing press on its leader, Jeremy Corbyn. In the US, the current of opposition and resistance is running through the #MeToo wave of revulsion at sexual harassment and male abuse of power. A groper-in-chief president faces his own public reckoning, as more and more voices – this week, a blistering denunciation from the editorial board of USA Today –call out his presumption of the right to belittle and humiliate. Trump remains in office, and Brexit proceeds, but unearned entitlement is everywhere on the run. The enemies of democracy – from oligarchs to billionaires – have reason to be fearful. This piece was originally published in the New York Review of Books on December 14, 2017.